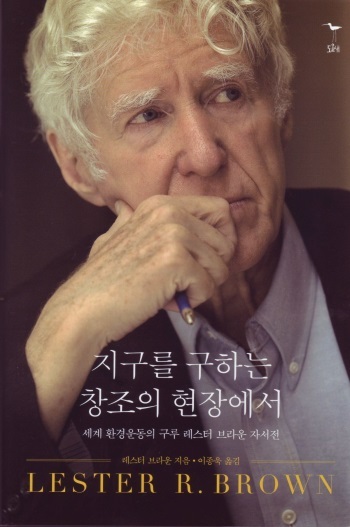 The Korean and Japanese editions of Lester Brown’s autobiography, Breaking New Ground, are available. The Korean edition by Doyosae, under the auspices of the Korea Green Fund and KFEM, was released several months ago—the first of the international editions! The Japanese edition was recently released at IKARI’s 55th anniversary event where each of the 600 people in attendance received a copy. According to our publisher, Soki Oda of World Watch Japan, they were “delighted to receive copies and even more delighted to learn that it was Lester’s autobiography.” IKARI sponsored this edition. Translation, especially to make it an enjoyable read, is never simple. The Japanese edition is especially readable and was done by volunteers, to whom we send our thanks: Hitomi Tsunekawa, Yuka Kinoshita, Hikaru Hamazaki, Tomomi Takaki, Yukari Kimura, Osamu Kusumoto, and Kunihiro Doi. The photo (right) is of Masatsugu Kurosawa, head of IKARI, with the book. IKARI has long supported the publication of EPI’s books in Japan. In fact Toshishige and Masatsugu Kurosawa regularly distribute thousands of copies of each book to Japanese opinion leaders, including members of the Diet and corporate leaders. And in case you missed it, the Hungarian edition is available electronically in PDF. Other languages in which the autobiography is being released include Chinese, Dutch, Farsi, Italian, Spanish, and Swedish.